Elephants are very attractive – more so in the wild than in captivity .. sadly its population is plummeting in recent years. Organisations are crying hoarse that Africa is currently experiencing the highest rate of elephant mortality in history, driven largely by a multibillion-dollar illicit ivory trade. Experts have warned that African elephants could become extinct within 10 years. Several hundred are killed every week by well-armed poachers seeking ivory, meat and body parts. Roughly 30,000 were killed last year, according to the International Fund for Animal Welfare. Chad, is a landlocked country in Central Africa. It is bordered by Libya, Sudan, Central African Republic, Cameroon and Nigeria. Chad remains plagued by political violence and recurrent attempted coups d'état; it is also one of the poorest and most corrupt countries in the world; most inhabitants live in poverty as subsistence herders and farmers. Since 2003, crude oil has become the country's primary source of export earnings, superseding the traditional cotton industry. Have recently posted on the killing of the famous - 50 year-old elephant named Satao, one of Africa’s last ‘great tusker’ elephants, by poachers in Kenya. Satao was famed for his giant tusks which weighed more than 100lbs which were so large and were easily identifiable from the air touching the ground. He spent the last 45 years of his life roaming around the Tsavo East National Park, a large park located in Southern Kenya, but the giant bull had in recent weeks relocated to the boundary of the national park to find new vegetation and fresh water. It was reported elephant poaching is a colonial vestige – earlier seen as a sport for noblemen and was exploited by the colonial governors. Among the game hunters, the bull elephant was said to be the most exhilarating form of elephant hunting. Small-bore rifles appeared to be the preferred option and aiming at the brain instead of the heart was another preference, though the motive was not always monetary for many of the hunters. Poaching is a serious problem, particularly of elephants for the profitable ivory industry and a threat to lives of rangers even in the national parks in many countries of Africa. The problem is worsened by the fact that the parks are understaffed and that a number of wardens have been murdered by poachers. Read this interesting article in globalanimal.org that — U.S. Marines were deployed to Chad to help park rangers deal with the increasing number of poachers. This small group of Marines will spend about a month with the Chadian Ministry of Environment’s Mobile Brigade, teaching the rangers different techniques for patrolling, marksmanship, land navigation, and site exploitation. The Marines’ mission comes at a critical time for African wildlife given that thousands of elephants have died over the years due to illegal poaching—with the Zakouma National Park’s elephant population dropping from 4,000 to 450 in a span of just five years. Continue reading to find out more about the Marines’ mission to help save wildlife in Chad. In a crime of unthinkable proportions, the report states that African poachers are poisoning watering holes with cyanide in order to kill elephants for their ivory tusks ~ and to deal with such ruthless poachers a small contingent of US Marines reportedly have been deployed. About 15 members of Special-Purpose Marine Air-Ground Task Force Africa 14.1 out of Naval Air Station Sigonella, Italy, deployed to the central African country in late April. They are spending about a month training approximately 100 members of the Chadian Ministry of Environment’s Mobile Brigade. The Marines, are to teach Chadian rangers small-unit tactics, patrolling, marksmanship, land navigation and site exploitation. While the mission is not expressly an anti-poaching one, it will help rangers combat heavily armed poachers who are more akin to soldiers than hunters and have decimated elephant populations in the Zakouma National Park. 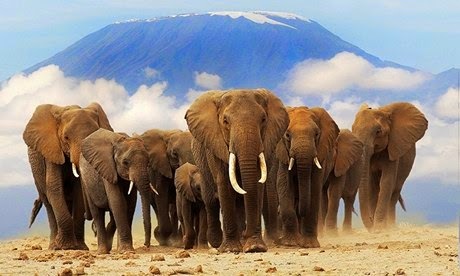 The elephant population has dwindled from 4000 to 450 in just 5 years. The armed forces of Chad would benefit by the training by US Marines; while it gives the U.S. military a foot in the door in an area plagued by instability and radical terrorist organizations. Chad is part of the Sahel region, a geographic band spanning Africa from east to west. It is an area of topographic transition, where heavy rainforest gives way to desert. Several extremist groups operate within this volatile strip, including the terrorist organization Boko Haram, which calls neighboring Nigeria home. The brazen Islamist group outraged the world recently by kidnapping scores of young girls whom the group’s leader has said he will sell. Nigeria, in fact, has declared a state of emergency in at least one state that borders Chad. Elephants are no doubt at great risk at the hands of poachers and the growing demand in Asia especially China for ivory products. The increased demand for endangered animal products, including elephants and rhinos, has made the illicit trade in wildlife the fourth largest in the world. With regards – S. Sampathkumar 18th June 2014.